The 12 Days of a (Carroty) Christmas - Just Veg. From all of us at Just Veg, we wish you a very carroty Christmas! May your Christmas and New Year be full of good health, cheer and lots of carrots. As we prepare for the festive season, we, the Farmers’ Wives took the opportunity to road test some of our favourite Just Veg carroty recipes to make sure they were just right for you. After a delicious carroty feast in the name of research, we can share with you our very own carrot inspired 12 days of Christmas! You can’t go past this. You’ll probably be wondering (as we were) why didn’t we think of this sooner? Simply arrange Just Veg carrot sticks with fresh green beans and cubed cheese as pictured. Done. This is so seriously easy. It’s also massively on-trend and will be sure to impress. Perfect for last minute small gifts for your hosts or co-workers or book club members. Promise, you can whip this up in 10 minutes. Find the recipe Find the Quick Pickled Carrot recipe here..
One bag of Just Veg carrot shred will yield about three jars of pickles. Are you trying not to eat ALL the rum balls? Then try these bliss balls. Don’t mention that they’re healthy and they’ll eat them by the bowl full. An easy entertaining option that the whole family WILL eat. And a classic bit of veggie smuggling over the festive season when well-balanced meals can sometimes (speaking from experience) go out the window. Here’s the recipe. 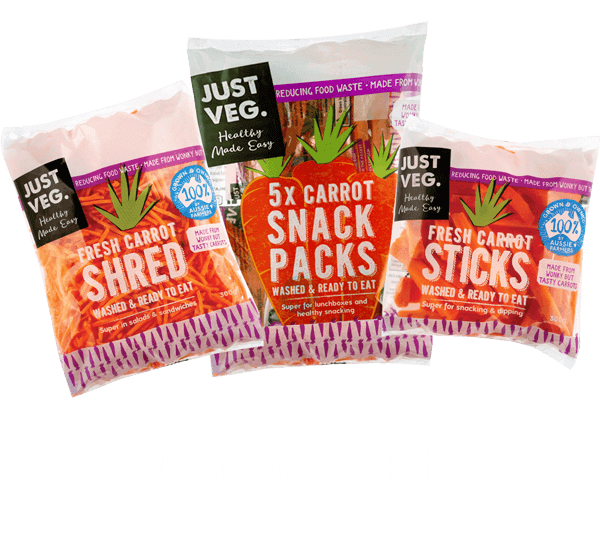 We’re not saying you shouldn’t pack some travel treats as well, but you can also mix it up with some handy crunchy carrot sticks and dip. You’ll all arrive at your destination feeling a lot better. Another easy entertaining option for the whole family to enjoy for a morning or afternoon snack. You can also make larger ones for dinner – and post Christmas add some leftover Christmas Ham. Find the Carrot Fritters recipe here. Ready in under 10 Minutes. This Vietnamese Carrot Salad recipe has been on high rotation on all of our homes. It’s a winner. Tip: adjust the dressing quantities to taste, e.g. add more sugar or leave out the chilli. Great for entertaining, rice paper rolls are also a fun ‘interactive’ lunch or dinner idea the whole family will enjoy. Just Veg team member Vicki, a teacher and mum of three boys, says adding an element of competition helps keep the kids engaged – who in the family can create the most impressive rolls? Possibilities are endless, see our speedy rice paper roll recipe here. Carrot sticks and dips. A brighty, crunchy, healthy, Christmassy must. Wine is a good addition too. Here’s a great hummus recipe. A light and easy lunch or dinner before the big day of feasting. We’ve found you can make this Chinese Chicken Salad recipe ahead of time (leaving the dressing off and the chicken separate) and it’s a super easy go-to option in the fridge for lunch or dinner when you’ve been out and everyone is starrrrrrrrving-and-has-to-eat-right-NOW! 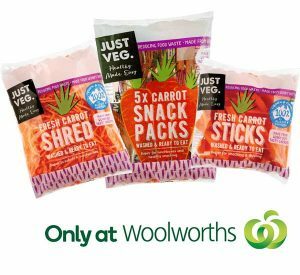 Carrots for dessert – Yay! This is a traditional celebration dessert from India.Try the Carrot Halwa recipe here. DAY TWELVE: DON’T FORGET SANTA’S SNACK!